I spied this critter by accident. O.K., maybe it wasn't actually an accident. Maybe I was supposed to see this critter. Accidents are like when you wash whites with colors, and your husband ends up with pink underwear and pink ties. O.K. I guess that's wrong too, cuz I guess you don't wash your husband's ties. Or, do ya? Heck, I'm married to a farmer... why would you expect me to know how to take care of ties??? Oh wait, you weren't asking me, were ya? Anyway... back to the topic which I apparently drifted away from. I was actually back at my pond photographing another dragonfly when something just beyond the area I was photographing caught my attention. The thing that caught my attention was the critter in the photograph below. While photographing it, I knew it was a new sighting for me. However, what I didn't know at the time was that it's a first sighting of this critter in my county too. Sorry, but that excites me! Yes, I know I'm weird for loving my bugs... so, you shouldn't be surprised to hear that I'm excited to be the first to see a particular bug in my area. And, anyway, why the heck would you expect a girl who's obsessed with bugs to know how to care for ties??? Oh yeah, you didn't ask me about ties. Geesh, this drifting brain of mine! This is an Amber-Winged Spreadwing. You probably won't think so, but I think it's awesome! I love it! Gorgeous capture! I do think it's awesome. Love the blue eyes, especially. I think it is amazing you captured that on camera! wow, that is so unique! amazing shot, Misty. 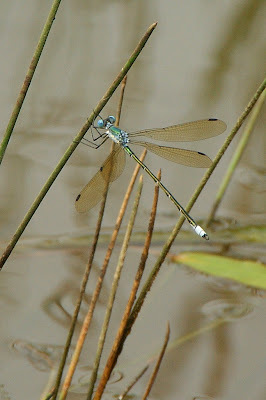 This is called a damsel fly. Very beautiful capture. This is incredible! The delicacy of this little creature is fascinating! Beautiful photo! I love it too, great shot Misty and a great little critter. Wonderful blue eyed guy shot! Misty: What a great find, they are so delicate. What a beautiful shot. I love the title of your blog,wish I could say the same, my dog drives me crazy. LOL. It is awesome, well composed and well taken. Great shot! You always find the best flutterers of all kinds! He's quite pretty!